Ever since the Space Invaders craze swept through the nation back in the early 80s, more space shoot-'em-up games have been released than just about any other kind of computer entertainment. Strangely enough, not too many have been released for the ST—until recently, that is. First came MichTron's Goldrunner, and now, following the same tradition, we have Plutos from Mindscape. In Plutos— which is very similar to Goldrunner—you pilot your spacecraft over the surface of an alien fortress, destroying as much as you can, while at the same time dodging and battling the fortress's airborne defenses. There's really not much to say about a game like this: You shoot and shoot and shoot, until your joystick hand is so numb you're forced to pause the game for a breather—or your ship has taken too many hits, bringing on the end of the game. 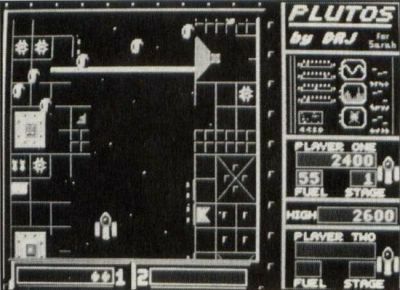 Plutos reminds me of the first game I ever purchased for my Atari 800, way back in the Stone Age: Caverns of Mars. You remember that one? In Plutos, just like Caverns of Mars, shooting fuel dumps refuels your ship. (I've never been able to figure out how destroying one of these things manages to fill a ship's fuel tanks; a case of artistic license, I guess.) There's also the waves of enemy spacecraft that you must guide your ship through, either by clever dodging or skillful blasting. Other targets in this nicely animated game include flip-flopping discs, twirling balls (they actually look a lot like soccer balls) and spinning spacecraft. Some extra surface targets include question marks that, when shot out (you need multiple hits), may or may not award you with an extra life, rotating disks that fire missiles, and various sizes of buildings. The object of the game is to blast your way to the end of each fortress, then shoot out the eyes of the cybernetic sentry guarding the entry to the next level. If you manage to blind the sentry, you'll be moved to the next level. If you don't, you'll have to repeat the current level. Each succeeding level offers more action than the one before, making this one of those games that joysticks dread. Though the graphics offered here aren't as nicely done as those of its predecessor, Goldrunner, the game is, I think, more exciting to play. All in all, not a bad job.